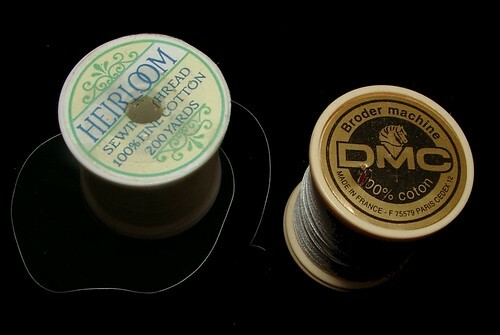 Ok I have decided to start Heirloom Sewing 101= HS101. So watch for titles that start with "HS101:" then the part or title will follow. There will be a link on the side bar under "labels:tags" with the name of HS101 that you can click on when working on projects to find the tutorials easily. Sorry this took a while to compile all this information. The tutorials should be faster to post as most techniques are simple. You do not need everything in this list it is more a resource for you to come back to if you have questions. Today = Supply list so you have a chance to go out and get what you need to be ready for the classes. The classes are not going to cost you a class fee but you will have to buy supplies/find them not always the easiest thing to do. The classes will be posted here on my blog. You are welcome to ask questions I will answer what I can. I do not claim to know all on this subject at all but I can give you a great starting point and you can take it from there. We are just making swatches for you to keep in a notebook not a project at this point. Please realize I may have missed something here in the supply list and not everything in this list is needed some are just helpful. If you want to wait and see the tutorials then you can figure out what you need as we go, or you can always go back and do this later after tutorials to see if it interests you or not. Please don't go out and spend a fortune and blame me. Don't let this list scare you like I said most is just fyi stuff and not needed but a reference source for future work. Heirloom fabrics (you don't need all of these it is just a reference for future use) 1 will suffice and you don't need much for samples so please do not go out and buy the whole nine yards as the old saying goes that would be a small fortune. I recommend a simple 100% cotton batiste 1/4 yard or less. cotton/and cotton blends (my knowledge is 13 years old and I have not done any of this type of sewing in a while so some of these fabrics may be obsolete now but it should give you a good starting point). The 100% cotton ones are the most expensive the blends cost less and wash easier but harder to work with. Bearissima I: Swiss batiste sheer, used in christening gowns and pinafores, and childrens dresses up to size 3 not as strong or as thick for older children. Imperial batiste, 35 % cotton and 65 % polyester, inexpensive and washes easy. warning these fibers tend to do their own thing can be a pain to work with during construction. Viyella : 20% wool 805 cotton, this is washable, good for coats dresses and jackets. 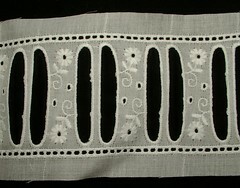 French and Swiss lace samples: I suggest seeing each tutorial first and seeing what you have or if you can sub. You don't need much so don't go slap happy as they are expensive. If you cannot find these you can substitute on some lessons but on others you will need the real thing (for shaping you need the real thing). 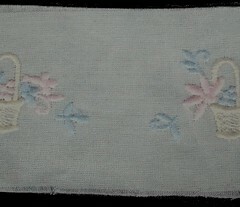 When making clothing or other heirloom items for real please do use the real thing as it will affect the quality of your work. 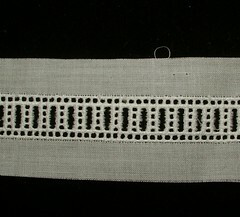 this sample of French lace edging is attached to a piece of Swiss entredeux. You can buy machine made tatting these days that can be sewn on with a machine as it has a chain stitch holding the picots together. I do not recommend machine sewing hand made tatting as the needle can cut/sever and break the knots in tatting. This first sample is a machine made tatted insertion beading sorry the second is the only machine made tatted edging I have and it is already attached to one of the samples for the tutorials. 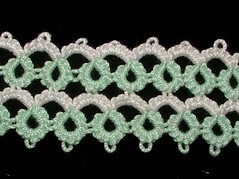 You can always add a crochet chain to your own tatting to make it able to be sewn on by machine but the time to do that would probably be longer than just hand sewing it. 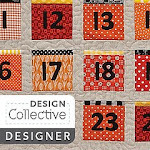 You can usually make this yourself not usually found in stores but you can find it at antique stores, thrift shops, and garage sales and things of that sort even flee-marts. Can be machine sewn onto to item (this is just info you do not need it for lessons). 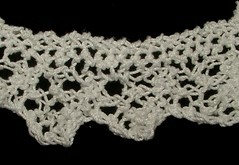 I am still learning how to knit lace so I don't have many samples of this. This is one edging I have made and it isn't blocked yet it would look lacier after blocking. 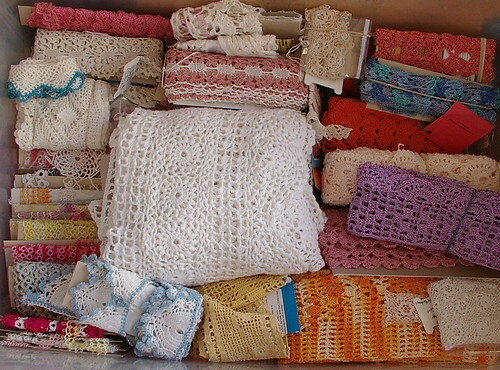 Crochet: Can be machine or hand sewn on. You can find some at antique stores, thrift stores and garage sales, flee marts... You can make it your self. Not usually found new in stores (might have a unique store in your area who knows). 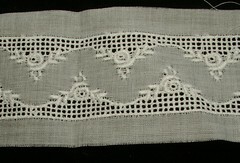 You can use family heirloom lace up this way like your great grandmothers lace and so on. If you do use family heirlooms please do practice before using it as I would hate you to wreck something that can not be replaced. 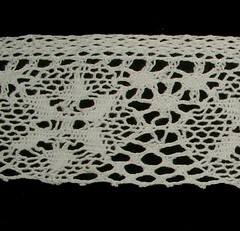 crochet edging : This is an antique piece that was damaged and in 6 pieces I took the damaged parts away and re-crocheted them and added a new header (the top part) so it can now be used and I have almost 2 yards. Here is a small sampling of handmade laces I have ready to use at all times. Some are antique some vintage some new. Some are even a mixture of the these. 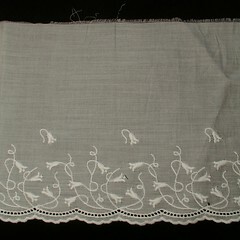 Meaning antique trims with vintage thread made by me thus new. 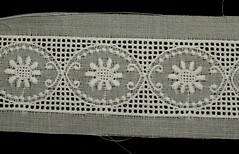 Traditional Heirloom sewing does mix and match laces so if you do this it is fine it is a nice way to use one real nice (expensive) focal point lace with lots of other lace as filler and make the item look real expensive when you have actually only used one real expensive piece. 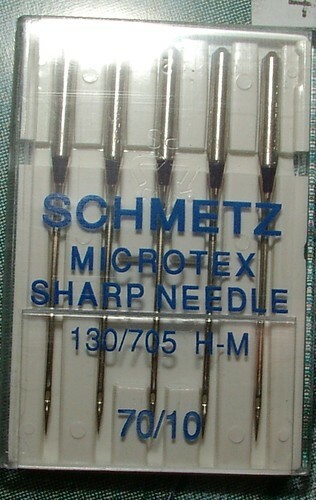 # 1.6/70 or #2.0/80 twin needle ( this is used for pintucks) make sure you get one that works with your machine the wider the spacing the larger the pin tuck but some machines the older ones (10 years or older) can not use the very large ones. 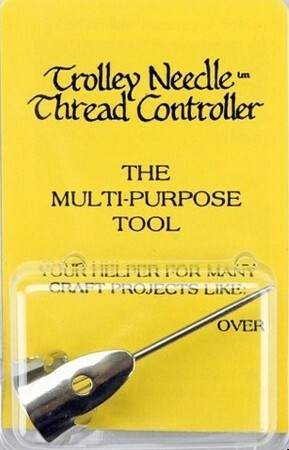 There are triple needles too but we are only working with twin needles for this. please have it cleaned oiled and serviced and it needs to have an adjustable zig zag stitch (in other words a simple basic machine is fine if it is in good working order. I do not own a fancy machine would love to someday but basic works. We are going to do heirloom sewing on normal machines in other words not the fancy ones. beauty pins (these are optional very traditional but terribly hard to fine)I found a site on line that sells these they are expensive so I do not recommend using beauty pins on everything. They do add a special touch but I don't have that type of money. Laundering either Ivory soap for every day use or fels-naptha if you are putting the item away for storage never store something starched that is just asking for bugs to eat your items. Fels-naptha has naphthalene in it that helps keep the bugs away. If you want the true heirloom patterns go for vintage/antique on either ebay or etsy if you can't get true vintage/antique here is your best sources. There are many great sources out there this is just a few. 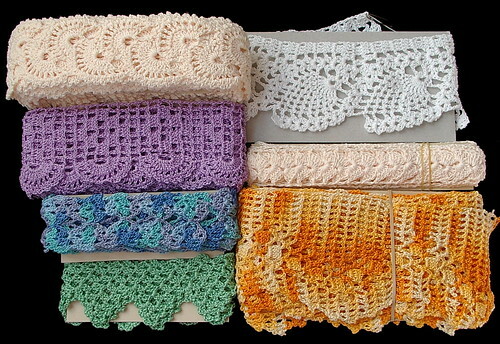 Thank you for posting that very pretty picture of your crochet edgings, I love it...reminds me of my Gran. Wow, an impressive collection of information! 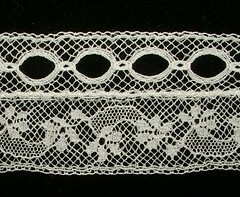 Just knowing the names of the types of lace is interesting for a layman. 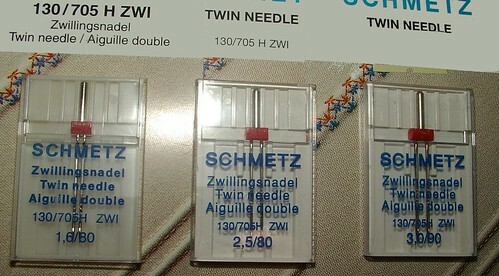 The two pieces of tatting labeled machine tatting are handmade. If you can see the knots (and you can) the work is handmade. 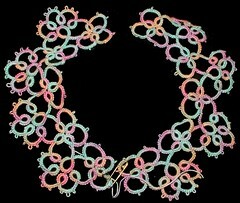 No one has invested the time and effort to reproduce tatting by machine. 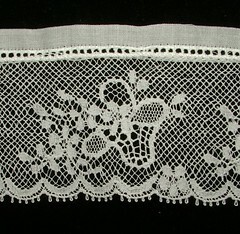 All machine made "tatting" is an embroidery to produce a burnout/chemical lace. 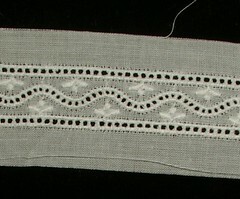 The knots are not reproduced in machine embroidered tatting. 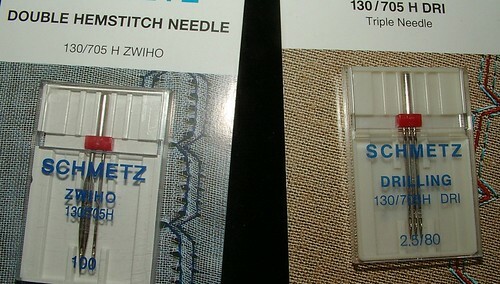 Your samples show the knots and the picots are single threads. 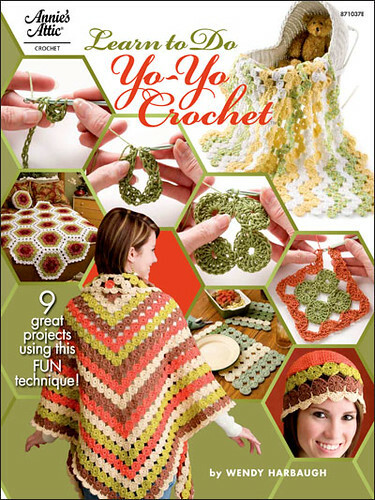 I love that you include tatting in your work and classes, but none of your samples in this posting are machine made.